DCSD likes his: Just what I was looking for. Wanted to stop my junk from bouncing about when running , twisting, lunging. This filled the bill better than expected. Thong is comfortable enough for several hours daily but wouldn't want to wear all day. Joseph J recommends it: I use it for fitness (Pilates & yoga). Similar to Capazio's padded belt, but flatter, thinner waist belt and MUCH nicer thong material. Both seem to use more padding than needed, not sure why. I'm a 30-31 so ordered the 30-32, it fit OK, but I thought it was a little large so ordered the 28-30 which fits much better. Definitely I would recommend buying this belt. Jim Sheets: It can’t be beat. 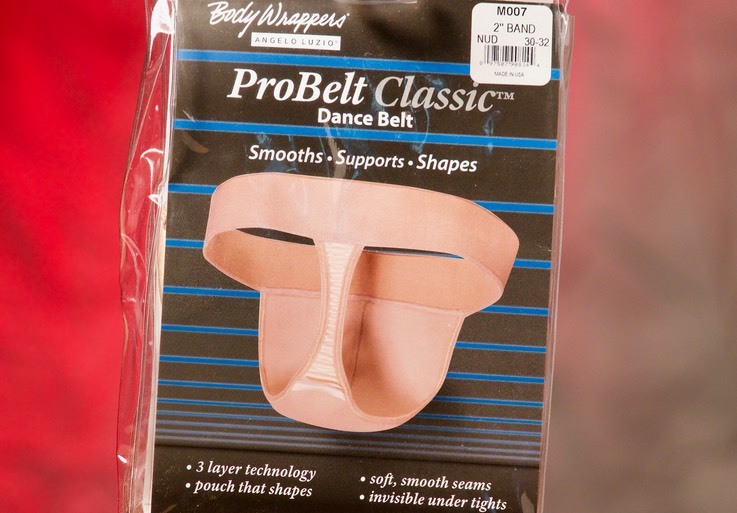 A great dance belt for my ballet class. Fit very nice and it didn't move during difficult movement. I would highly recommend it to anyone looking for a very comfortable dance belt. Dave: I just started dancing and after doing some research decided on this one. It was really tight when I first got it but as i wore it more It loosened up and became comfortable. The thong part took some getting used to as it can put a good deal of pressure on some softer spots but I got used to it. The pouch was a bit small but after doing some tucking I was able to make everything fit. really good belt overall and I’m quite happy with it! Santana says: Fits well overall, front pouch is a little wide but nothing inside moves while I wear it. The material is pretty nice and the thong design is comfortable. Kylie E. pronounces it the best: We have had so much trouble sourcing a dance belt that fits my super skinny son - 150cm tall, 12 year old - none of the belts that we tried fitted properly (either the waist fitted and the pouch was too big or the pouch fitted, but the waist was too big). I stumbled across the ProBelt and ordered the size 24”-26” size. It fitted like a glove everywhere! He wears it to several ballet classes a week and says that it is the most comfortable of all the brands that he has tried. It looks smooth under his unitard, fits well, no chafing and easy to wash. I would highly recommend the ProBelt to difficult to fit boys. Lisa bought one for her 10 year-old: He fits the 26-28. He's about 4'7", and 85-90 pounds. He was quite concerned about graduating to a thong, but after one class in the new belt, he got used to it and it doesn't bother him at all. Verified Amazon Customer: Wow, this is light years better than Capezio's dance belts. Capezio's have a seam that really hurts after more than an hour and a half of wearing, but these are comfortable for an entire day. I am a dancer and I wear these to class every day, they provide the necessary support, comfort, and range of motion that I need to be able to do all of the steps full out. Elison is not a fan: I find the pouch just a bit to wide and not as supportive as I would have hoped. I use other Body Wrappers, somehow this just isn't the fit I have come to expect.